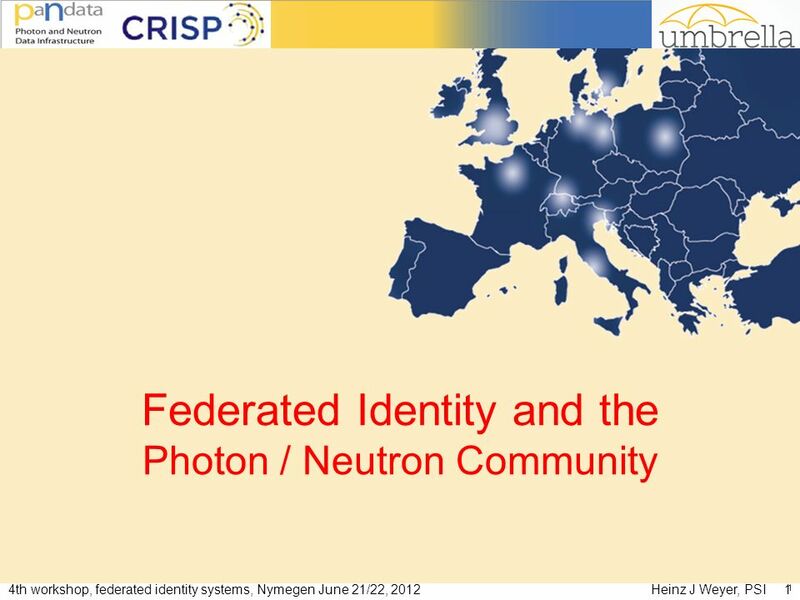 4th workshop, federated identity systems, Nymegen June 21/22, 2012Heinz J Weyer, PSI 1 1 Federated Identity and the Photon / Neutron Community. 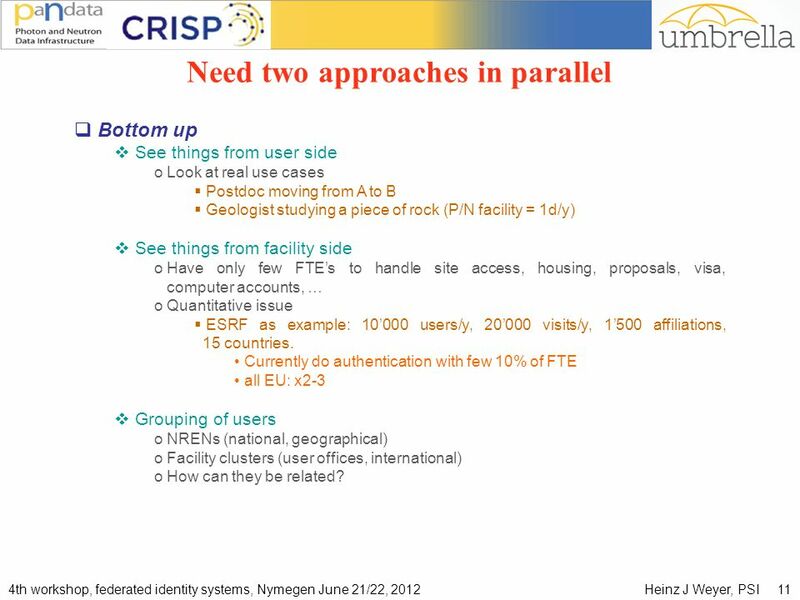 11 4th workshop, federated identity systems, Nymegen June 21/22, 2012Heinz J Weyer, PSI 11 Need two approaches in parallel Bottom up See things from user side o Look at real use cases Postdoc moving from A to B Geologist studying a piece of rock (P/N facility = 1d/y) See things from facility side o Have only few FTEs to handle site access, housing, proposals, visa, computer accounts, … o Quantitative issue ESRF as example: 10000 users/y, 20000 visits/y, 1500 affiliations, 15 countries. 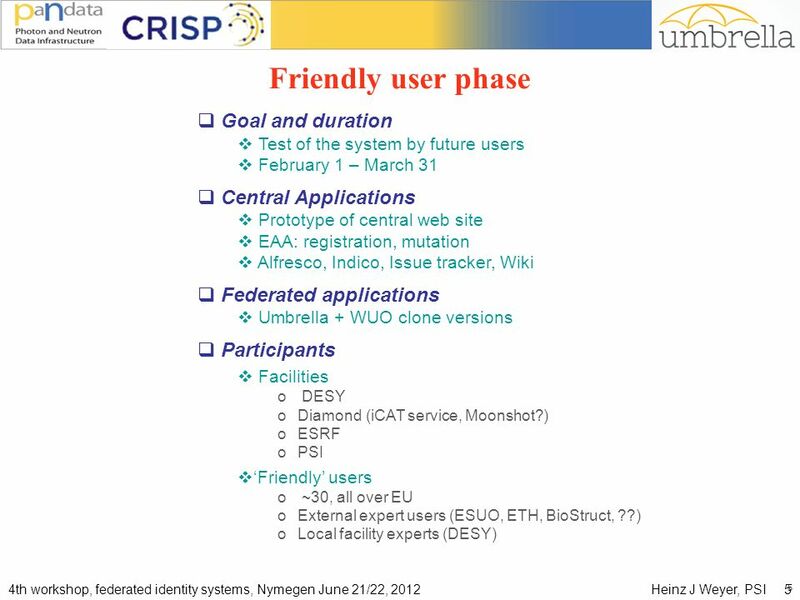 Currently do authentication with few 10% of FTE all EU: x2-3 Grouping of users o NRENs (national, geographical) o Facility clusters (user offices, international) o How can they be related? 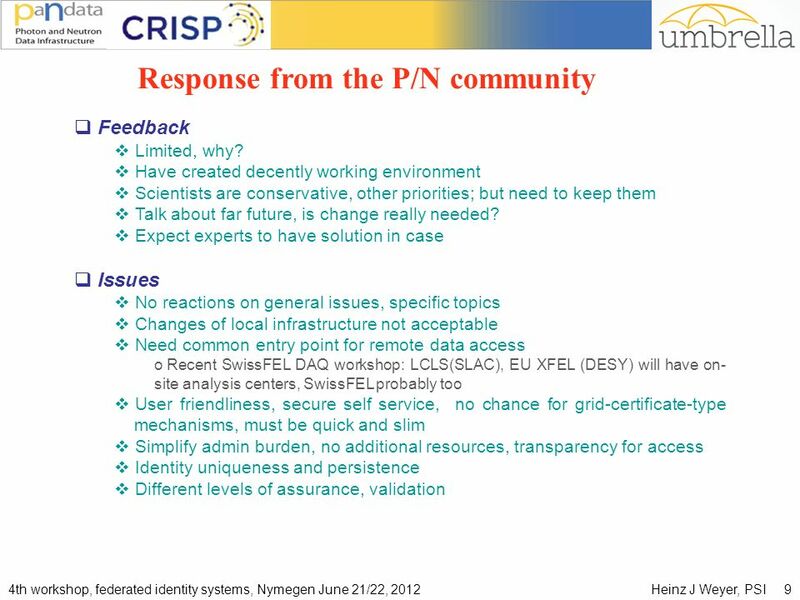 12 4th workshop, federated identity systems, Nymegen June 21/22, 2012Heinz J Weyer, PSI 12 FIM and New vistas Bridging, different federations CRISP o Partly topic of WP16 (PSI and GSI) Different options o No answer, islands Too dangerous, do not trust o Fully transparent Risky o Bridging User can e.g. 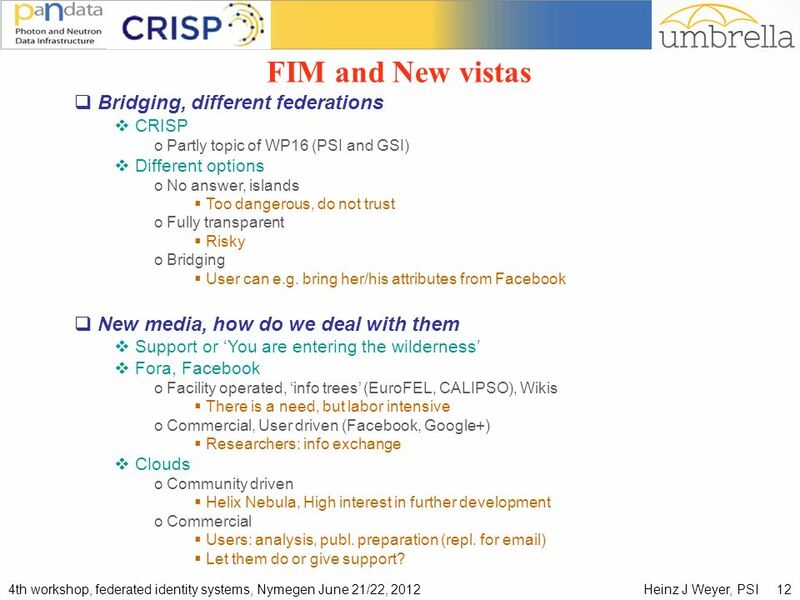 bring her/his attributes from Facebook New media, how do we deal with them Support or You are entering the wilderness Fora, Facebook o Facility operated, info trees (EuroFEL, CALIPSO), Wikis There is a need, but labor intensive o Commercial, User driven (Facebook, Google+) Researchers: info exchange Clouds o Community driven Helix Nebula, High interest in further development o Commercial Users: analysis, publ. preparation (repl. for email) Let them do or give support? Download ppt "4th workshop, federated identity systems, Nymegen June 21/22, 2012Heinz J Weyer, PSI 1 1 Federated Identity and the Photon / Neutron Community." 4. 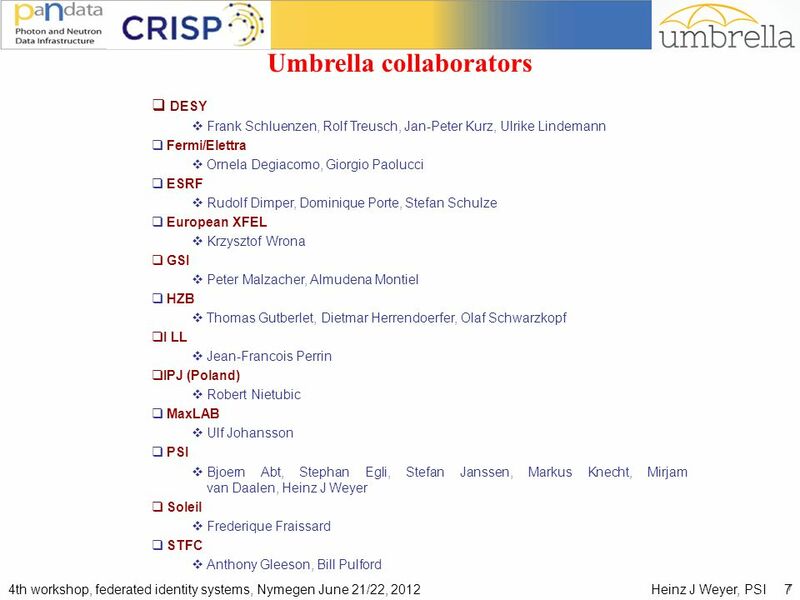 May 2007 Workshop on Dynamic Service Level AgreementsPage 1 Dynamic SLA Negotiation in BREIN Bastian Koller High Performance Computing Center Stuttgart. 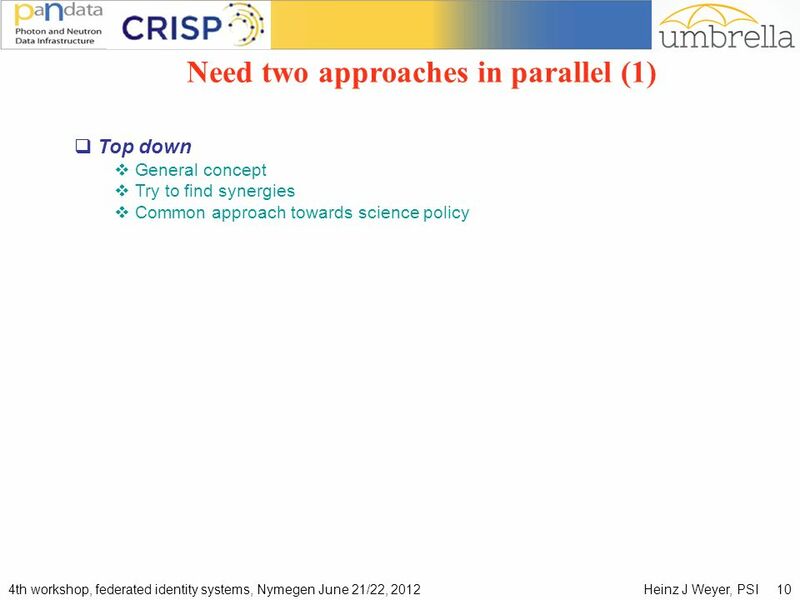 1 From Grids to Service-Oriented Knowledge Utilities research challenges Thierry Priol. DRIVER Long Term Preservation for Enhanced Publications in the DRIVER Infrastructure 1 WePreserve Workshop, October 2008 Dale Peters, Scientific Technical. 1 Future strategy for e-submission as seen by industry Dr Michael Colmorgen, IFAH-Europe 2nd Veterinary Workshop on E-submission 4 Dec 2009, EMEA, London. 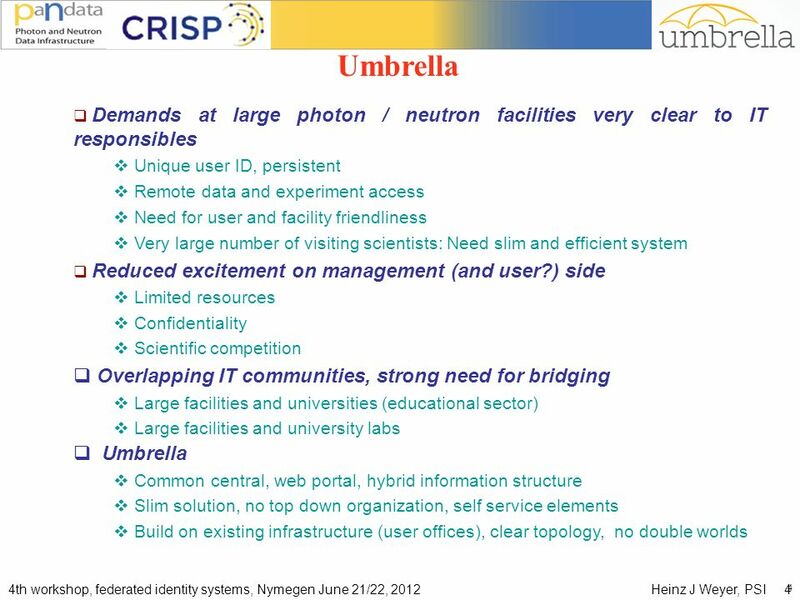 © ITU Telecommunication Development Bureau (BDT) – E-Strategy Unit.. 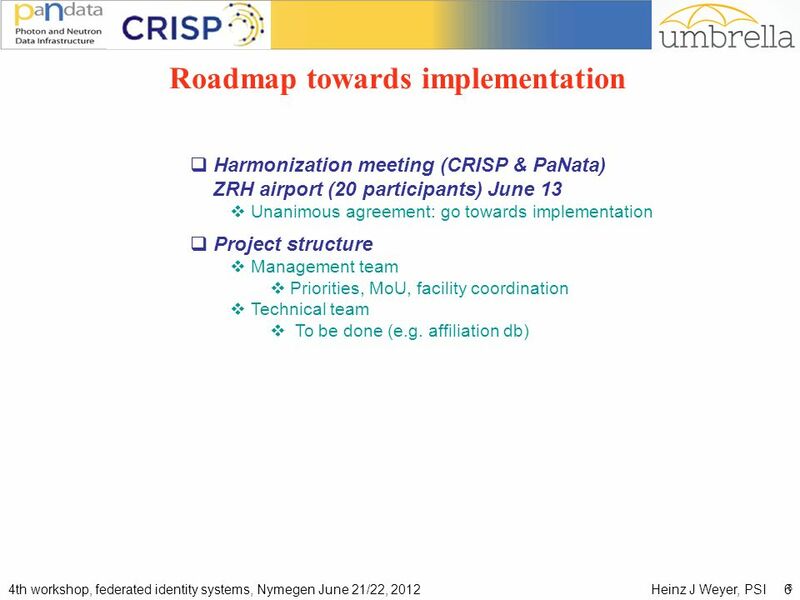 Page - 1 Building Confidence in E-government Services ITU-T Workshop on. 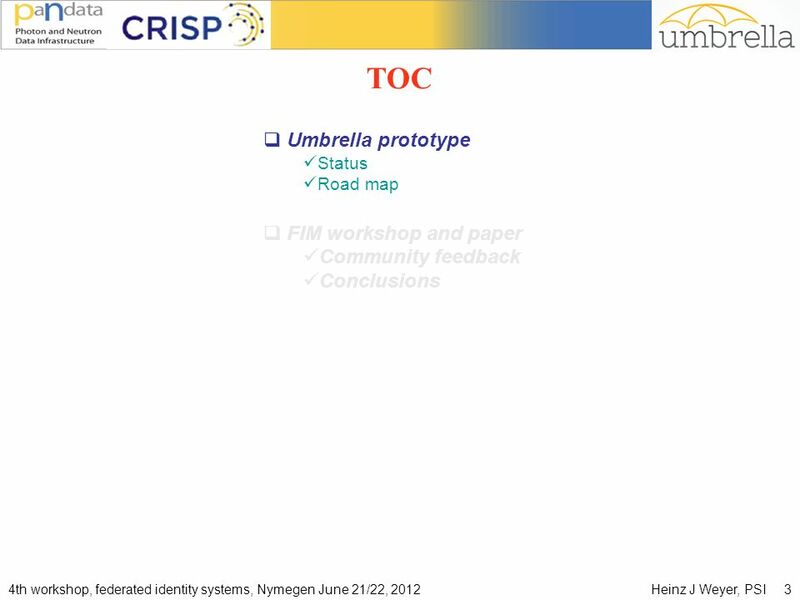 Tango Meeting DESY Status Report Thorsten Kracht Grenoble, 13. May 2009. Presented by Brad Jacobson The Publisher on the Web Exploiting the new online sales channels. 1 The interconnection of business registers Judit Fischer – DG Internal Market and Services Budapest, 14 June 2010. Day: Wednesday 9 th November Session: 11.00am am Speaker: Bas Kok Topic:The EU requirement for land information.